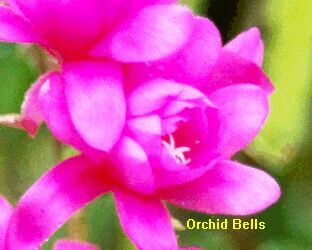 Epiphyllums / Epies/orchid cacti/ jungle cacti are a group of succulents (specie and hybrid) which originate in the rainforest of South America. The succulent stems give rise to the most spectacular blooms. The colours are amazing. Some plants have blooms that are the size of dinner plates and others will be minute. All colours and shades of the spectrum can be found, except for the colour blue. These blooms last from a day to a week. Some are night bloomers and others open during the day. Place your epies where you can enjoy the different facets of the growth cycle. Originally the species existed in these forests, but man and nature decided otherwise and today more than 12000 registered hybrids exist. More are registered each year. Epiphyllums commence life as terrestrial plants, they finally end up growing in the trees and upper canopy of the rain forests. Their root system is very fine and hair like. Preferring to anchor themselves between the forks of branches, where humus and debris from the host tree is deposited. This well draining, light rooting medium, offers ideal growing conditions for these succulents. Remember that much rain water washes over the plants, when they are growing in nature, but is not retained by the growing medium. 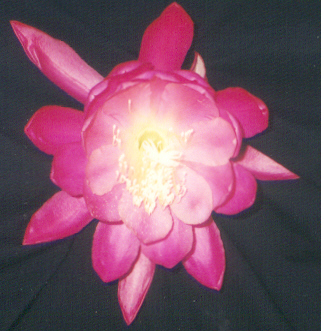 One should strive to replicate this type of "soil" when growing epiphyllum. Although they are from the succulent family, they will need dappled shade and the correct level of moisture to maintain a healthy growth cycle. Placing them in an area where they can receive morning sun and filtered sunlight during the rest of the day, replicates their original environment. They cannot tolerate frost or freezing conditions and will need to be protected from these extreme temperatures. If you have to bring them indoors during winter, then store them in an unheated room where they receive little or no water for the winter. They will go to "sleep"
Epies enjoy good air circulation. They benefit from light applications of fertilizer. I like to use orchid food on mine. I only commence feeding once a month, after the spring flowers have gone and end a month before winter. Too much nitrogen will at worst burn the plants delicate root system, or produce more vegetative growth and little flowers. Watering is done on a closely monitored basis. I like to water when the soil is just damp under the surface. The "finger test" is the method I find most reliable. Epies can be grown from collecting the seed pods from the spent flowers. These are also edible. Cuttings are the more common place way of starting a new plant. This will ensure that you have the plant of your choice. 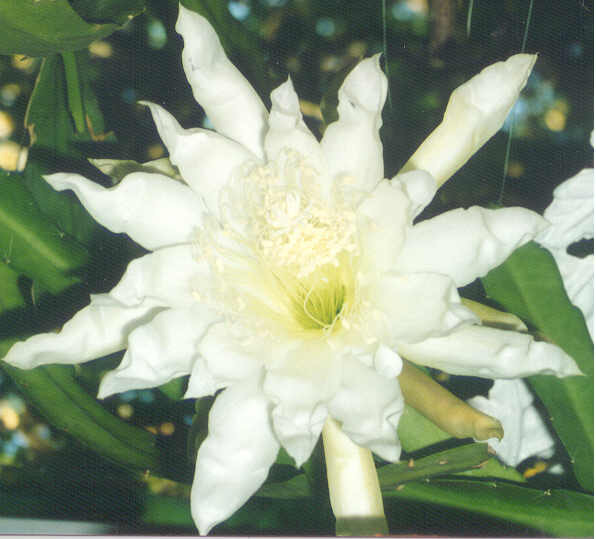 It takes up to 5 years to produce blooms from a cutting and more than 7 from seed. Cuttings must be "healed" This entails drying the cutting in a dry shady spot for a week. This ensures that the cut end is calloused and goes a long way in preventing the rotting of that cutting. I usually plant my healed cutting in a medium of 1/3 fine pine bark, !/3 potting soil and !/3 Perlite. The cutting is planted !/3 into the soil. I like to use 10 cm pots to start a cutting, as the plant does better when it is root bound. I will keep it in this for 2 years at least. Or until it becomes too big for the container. When starting off a cutting, remember to keep the watering to a minimum. I will initially just mist it for a few weeks. Then when I can feel that the cutting has rooted, ( a gentle tug will tell if it has produced roots) I step up the watering to a teaspoon full a few times a week. You will start to use the finger test now. Soon you will start to see shoots appearing from below the soil line, or from the cutting. Epies grow very quickly and you will be fascinated by their vegitative growth. I find all phases of this plant intriquing. Please enjoy my epies with me.